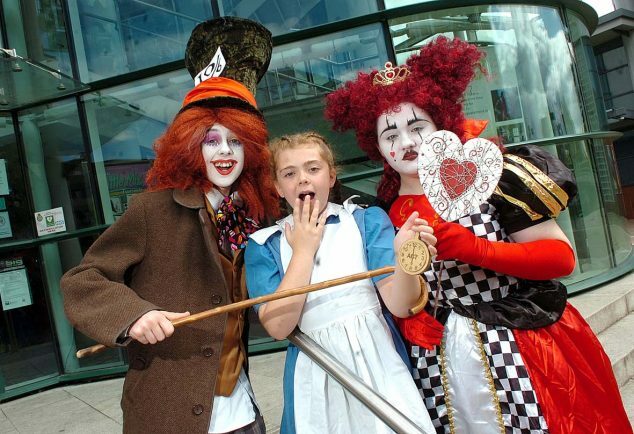 Alice in Wonderland Mad Hatter (Niall Edwards), Alice (Olivia Edwards) and the Queen of Hearts (Becky Exley) can't quite believe the time. Picture by Marcus Mingins. LAST Saturday, August 12, audiences were treated to two performances of ‘Alice in Wonderland’ by the Palace Youth Theatre Summer School – and it’s a real shame there were only two opportunities to see this fantastic cast in action, writes Jen Stone. From a breakdancing Caterpillar, to a hilariously mis-matched King and Queen of Hearts, a perfectly imperfect pairing of The Tweedles, an utterly insane tea-party and a superbly sassy group of flowers (the Golden Afternoons) this production couldn’t fail to entertain. And watch out Bonnie Langford – Olivia Edwards tumbled through Wonderland with confidence and complete control! The odd technical issue made the performance a little clunky in places and some of the singing wasn’t perfect but the enthusiasm and commitment of the cast meant audiences left merrily humming ‘Zippedee doo dah’ . In fact, when a prop ‘disappeared’ in the tea party scene both Alice and the Mad Hatter ad-libbed in character with an assured confidence until the missing piece of kit magically re-appeared creating a lovely moment of shared laughter between both audience and cast. The set was simple but effective, the costumes colourful, the dances well-choreographed and the nature of the play meant everyone was allowed their moment in the spotlight. How the amazing PYT team put this together in just two weeks, is anyone’s guess. So, next year, if you are looking for live, family entertainment, look no further than your local theatre – it really is well worth going along, you’ll come out smiling, singing and hoping that you might catch a glimpse of a white rabbit sometime soon.